Looking For A New or Used BMW Engine? Plenty of good reasons that explain why you could be looking for a BMW used engine for sale. The motor might have seized, you might have undergone a nasty automobile accident or the engine is basically too old and requires replacement. Whenever your car is the main mode of getting around, you need to get a new motor as soon as possible so you can get back to normal living. Whether you are looking for BMW Spares or used engines, we’ll help you instantly contact our network of salvage yards and BMW engine importers in South Africa, no matter what the make or model of your vehicle. looking for a complete new or secondhand engine on a BMW M43, 2000 year model in the Mpumalanga area. I need a BMW 320i engine E90 2010 model. looking for a complete new or secondhand engine on a BMW X5 E70 Diesel, in the Johannesburg area. would like to know the price for a e46 325 m54b25 engine. looking for a complete new or secondhand engine on a BMW 328i, F30 N20 B20A, 2012 year model in the Johannesburg area. I'm looking for 325i double vanos engine for E46 model. I would also like to know if I can replace it with 320i engine. Core engine block new or used for a 2013 335. Urgently looking for a second hand e53 m62 engine with the above given specifications. looking for a secondhand engine on a BMW X5 4.4 E53, 2004 year model in the Vereeniging area. Looking for the above mentioned engine type good second hand please with low mileage. looking for a new or second-hand engine on a BMW 320i E32 6 cylinder, single vanos, 1994 year model, in the Cape Town area. looking for a complete new or secondhand engine on a BMW 118i, 2010 year model, in the Gauteng area. looking for a complete new or secondhand engine on a BMW 320i F30 petrol, 2012 year model, in the Pretoria area. 0665586970, looking for a complete second-hand engine on a BMW 320 diesel E46, 2003 year model, in the Cape Town area. looking for a BMW 320i F30 N20 engine new or second-hand in the Johannesburg area. looking for a new or second-hand complete engine on a BMW 320i, Motor Sport automatic, 2013 year model in the New Castle area please. looking for a BMW 320i E90 4 cylinder complete second-hand engine, 2006 year model in the Johannesburg area please. Looking for a sub essembly. My cyl head is fine. Also, if not possible, cost of complete second hand engine. looking for a complete second hand engine on a BMW 1.6, 2005 year model in the Johannesburg area please. looking for a second hand engine on a BMW E90 232i, 2006 year model in the Kuruman area please. How much it would be? looking for a complete second-hand or new engine on a BMW, E46, 325 double vanos, 2006 year model in the Cape Town area. looking for a new or second-hand engine on a BMW E46, 2002 year model in the Cape Town area please. looking for a BMW 3 series, 316, 1998 year model, complete second-hand engine, in the Rustenburg area. Reconditioned motor for a BMW 118i 2015 model. Please quote me a engine for a bmw 330i, 2005 model. looking for a complete second-hand engine on a BMW S235, M20 engine, 2011 year model. Need a BMW M30 3.2l engine complete. looking for a new or second-hand engine on a BMW E42, M42 engine, 2002 year model. looking for a second-hand computer box for a BMW 328 E36. I need a complete 120i cabriolet engine. can you provide a quote? Complete driving delight on the road. Excitement in abundance with each and every corner. The agile steering usual for BMW, the specially tuned suspension as well as perfect weight allocation provide a amazing nimble performance. Along with the Turbo inline 6-cylinder engine underneath the extensive bonnet, the brand new BMW 1 Series features a degree of mechanics incomparable in the lightweight category. Very sporty without a doubt! The very first from 1975: The 3 Series BMW will be the expression, of a trendy four door car. Within its 6th version, this appealing mixture of potent design, incomparable agility and superb day-to-day functionality is really as remarkable as always. Ideal weight allocation, traditional rear-wheel drive and robust, superior-efficiency diesel and petrol engines using BMW Efficient Dynamics engineering assure exceptional mechanics and reduced petrol consumption. Along with the M Sport, Luxury Line, or Sport Line package alternatives, it is possible to adjust your BMW 3 Series vehicle in accordance with your very own wants and needs. Produced by BMW from 1972, the BMW 5 Series is really a executive model. It’s the heir for the Brand new Class Vehicles and is presently within its 7th version. At first, the BMW 5 Series was just for sale in a 4 door body design. The very first generation of 5 Series BMW was run by a naturally aspirated straight-6 and inline-4 petrol engines. Subsequent models have already been run by straight-6, inline-4, V10 and V8 engines with equally natural turbocharging and aspiration. From 1982, diesel engines have been integrated within the 5 Series models. The 5 Series is BMW’s 2nd best selling model following the 3 Series. Manufactured by BMW since 1977, the BMW 7 Series is really a full-size luxurious 4 door vehicle. It’s the heir towards the BMW E3 “New Six” model and it’s presently within its 6th version. Being BMW’s flagship car the 7 Series is only obtainable as a 4 door (which includes limousine and long wheelbase models). The very first version of the 7 Series was operated by a straight-6 petrol engines, and subsequent models have been run by V12, V8, straight-6 and inline-4 engines with natural turbocharging and aspiration. From 1995, diesel engines have beenincorporated within the 7 Series range. The BMW X3 is a lightweight luxurious cross-over SUV produced by German car maker BMW from 2003. In line with the BMW 3 Series style, and today within its 3rd version, BMW sells the cross-over being a Sports Activity Automobile, the firms’s exclusive descriptor for their X-line of cars. The the superior range BMW X5 xDrive 50i incorporates a TwinPower Turbo Compressor inline 8-cylinder engine with 2 concurrent turbochargers with double-VANOS, Valvetronic and direct injection. It provides optimum torque of 650 Nm throughout a rev range between 2,000 to 4,500 rpm. This powerplant generates 330 kW to attain remarkable velocity coming from 0 to 100 km/h in only 4.9 secs. because of Higher Precision Injection, optimum performance is produced as a result of precisely-measured dosages of petrol being inserted into the ignition chamber, leading to fuel useage at 9.6 l/100 km as well as CO2 emissions of 224 g/km. When it comes to BMW parts, many immediately have positive associations on this subject, and BMW engines are no exception. But, as many years of experience in working with cars of this brand, directly with motors, many people think that these units have a high degree of reliability, are caused more by public opinion than reality. That is why it is worth considering some of the most popular models separately, to nevertheless understand their true origin, quality, and operational properties. These motors were the first models developed by great concern. The crankcase ventilation system is entirely primitive and works due to the differential pressure. CPG has minimal wear at 300-400 thousand km. traveled path. But the valve seals begin to lose their elasticity after 200 thousand km run. This suggests that with them, most likely, there will be problems. It is also worth noting that the requirements for oil are low for the simple reason that engines were created precisely at the time when the market of oil synthetics was only gaining momentum in its development, which meant it was not possible to search for something better, it was necessary to take what is. This generation of engines was repaired without any problems in his garage. The BMW M10 engine is a single-shaft carburetor engine that has an ignition distributor. Thanks to the constant release of updated versions and modifications, the engine was installed on Bavarian cars for almost 30 years. You can meet this engine in many cars, however, in Russia, they are a real rarity. The BMW M40 engine is an advanced engine of the previous brand with hydraulic compensators and belt drive. Not a common, but rather a reliable model. The BMW M20 is the first six-cylinder with a belt drive. This model took an intermediate position between m10 and m30. The fact is that the four cylinders of the M10 model did not give the opportunity to increase the engine size of more than 2 liters and reach full capacity, because the addition of two more cylinders helped to cope with the task. In our country, this engine was popular in picking with the E34, by the way, he proved himself on the positive side. BMW M30 engine – the main six-cylinder unit of the first generation. The set of characteristics of this engine is classic: an ignition distributor and one camshaft. The BMW M30 model had many modifications, including for sports cars of the M-Sport series. It became the basis for the popular sports engine S38. It should be noted that all these engines had one thing in common – they all had a low compression ratio, approximately 9: 1 and 8: 1. This made it possible to use fuel with any octane number, due to reduced sensitivity, and to produce factory turbocharged engines without any special modifications. If you believe the statistics, then this engine was the last potential “millionaire” of the first wave. This model has many significant differences, allowing to consider it apart from other engines of the first generation. This engine gave the much needed 4 valves per cylinder, basing the fashion on the “explosive” character of BMW engines, which has survived to the present day. In this engine, some new items have appeared, namely more modern spark plugs and ignition coils. It was this model that set the standard, which subsequently practically did not break, – “1Nm per 10 cubic centimeters of cylinder volume”, which was not possible to achieve in past atmospheric engines. It is true that after this there was a need to significantly change the compression ratio from 10 to 11: 1, it was possible to repeat this only in 2005, in the BMW N52 engine. This unit moves perfectly on 95 fuel, but for a 2-liter modification, even such an OFC may not be enough. The unit, which appeared in 1989, was probably the best in the history of the BMW Group regarding consumer and technical characteristics. Considering this engine, I immediately want to say that its name sounds a bit wrong because it is an improved series of M50. When in 1992 the unit received an update, it entered the markets with the M50TU index, and only then, over time, they decided to transfer it to a new generation. After all, this is the first engine that received an intake shaft timing control mechanism, known as VANOS. The addition of 2 valves led to a doubling of the flow area, which negatively affected the filling of the cylinders at low revs. It also caused the curvature of the torque characteristics, degrading the quality of driving at low speeds. The BMW VANOS system was supposed to smooth out engine operation by stretching the torque response. The power was increased, and this was done standardly – the enginemen drew 300 cubes – it turned out a 2.8-liter engine. By the way, according to some information, it became known that non-standard engines with a volume of 2.8 and 2.3 liters were created since it met the tax regulations of Germany at that time. 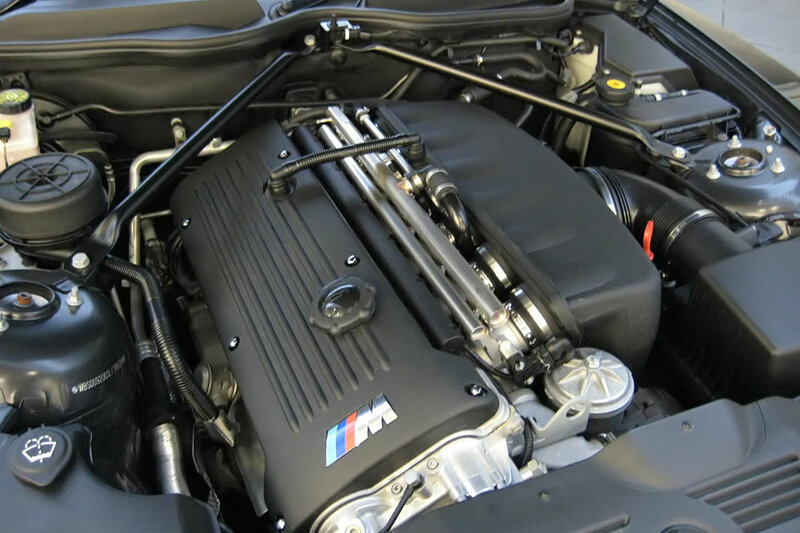 The engine block of the BMW M52 became aluminum, and the cylinders received a high-strength nikasilovoy coating. Manufacturers also took care of the environmental friendliness of their products and paid it due attention. M52 became the first engine with crankcase ventilation system, for this purpose they used a valve that opens “on demand” and has atmospheric pressure. They also raised the temperature of the thermostat opening, which increased to 88-92 degrees and higher than those of the first generation engines. The resource of this model has decreased, approximately, in two: defects of caps and CPG climb out from 200-250 thousand km, with an expected engine resource of 450-500 thousand km. The operating mode can take away or add 100 thousand km to this figure. Oil consumption, even with the partial loss of mobility of the rings, may be completely absent or remain extremely small. We can say that the BMW M52 engine was the last potential long-lived millionaire, with reasonable care. Features of operation are often associated with the emergence of problems with not yet fully electrical equipment and expensive consumables – throttle actuator cables are stretched and lose elasticity, issues with an anti-skid system occur, expensive flow meters, ABS units, and costly titanium oxygen sensors deteriorate. However, with proper care, you can count on an impressive engine resource. Most models E39 and E36 equipped with this engine. Reliability rating: 4/5. Rings: 4/5. Caps: 4/5. These motors are characterized by the improved elasticity of torque characteristics. The largest and most significant difference between the new and the old unit is in the thermostat, which has an opening point of 97 degrees – the operating mode is shifted to partial loads, which allowed for complete combustion of the fuel. This favorably affected the operation of the vehicle in the city mode. It was the BMW concern that opened this system and remains faithful to it, and no one until 2012 had time to intercept it and did not raise the degree of oil well beyond 100 degrees. If we talk about urban exploitation, the oil begins to oxidize twice as fast, and this leads to the fact that the maximum mileage decreases and becomes equal to 180 thousand km. Also, it is this engine that is very picky about the choice of fuel, and if you neglect this point, then in the future you can pay dearly. The designers also took care of raising the power characteristics, and that is why VANOS also began to control the exhaust shaft, and the DISA valve appears at the inlet. Only now the design is now plastic, and therefore not durable. The M54B30 engine has a wide rev range, but there is no longer any bright M50 performance. By the way, it is important to note the important point that the gas pedal is becoming electronic and very sensitive. And in a block of aluminum for the last time use cast-iron shells, but this is a turning point in the history of the concern. The motor, in spite of all its small flaws, is becoming very popular in our country and is especially prevalent in cars with the E53, E46 and E39 bodies. All units of the M series are characterized by the formation of slag on the neck for filling the oil, which allows determining the quality of the product used visually. The layer must be dry and thin; then you can immediately understand that the engine is alive. This is a new generation, which appeared in 2005. The unit is designed hot and frisky, as the engine compartment has received a new layout. All systems that were previously used have been improved. Oxygen sensors have become broadband; the collector has two stages, the reliability of the ventilation valve and many other things have improved. The block is made, as before, of aluminum alloy, but the cast-iron sleeves are no longer used. Instead, they have a special oil-retaining coating. Changed and the air supply system. It is worth saying that among the owners of cars of this concern, the expression “hit the Valvetronic”, which means a sum of 1000 euros, became popular. True, there is a small consolation, now fuel economy is 12%. Also, all N-motors have a problem with the control unit. Cars that are operated in the city, sometimes have problems with the motor associated with sticking rings, occurring approximately 50-60 thousand. Km. Run A little later, a problem with caps may begin to arise, and when the mileage is 100 thousand km, both issues need repair. After 100 thousand km the catalyst is clogged. In general, if the distance goes beyond 180 thousand km, you should not give preference to such a unit. And if in fact, the problems may arise much earlier, at about 100-120 thousand km. There is an engine quite often on cars of the first, third and fifth series. By the way, it should be said that the rumors about the modernization of the motor: the installation of the new skirt and rings were not confirmed, the resources of this model remained the same. Engines N series began to strive for environmental friendliness. But many fans of the brand were disappointed in the result. This suggests that not all innovations are successful. With the appearance of the N53 engine, it became clear that BMW diesel engines will soon take their deserved place among the gasoline “brothers.” The new line was created not as economic units, but as aimed at preserving the environment. Buyers had the opportunity to purchase engines with new injectors, with high pressure, as well as with all the shortcomings of a diesel engine. Also, Valvetronic did not get into the new model. It just did not fit. The series N54 Valvetronic also not included. But this model changed the engine row a bit, as turbines began to be used again. But in the series, N55 Valvetronic still returned, but the turbine system was removed. Yes, from this news, you can begin to rejoice. And it is this engine that is the most important and the most “diesel” among the entire series of this series. Concern decided not to promote the motor on the world market immediately. Perhaps due to coke formation in the injectors. But It is worth noting that at the same time, BMW coke injectors are very different from competitors’ products that use an open hole. Due to a different design of the valve cover, primary self-diagnosis now has nothing to do with the M series motors. To understand that the oil needs to be replaced, you can carefully look at the petals of the cover and examine the presence of a reddish-brown bloom there, you can first remove it, but then it will not be enough. In the second stage of “dying” oil, brown sand will appear on the lid. But the third and fourth stages will be visible quite strongly, as brown sand will be over the entire surface of the lid, and under it, you can see dirty-colored jelly. In general, if we sum up, it becomes clear that it is almost impossible to purchase an N55 series motor, which is good and will serve for a long time. And if the car is over five years old, then you should not even try. Plenty of good reasons that explain why you could be trying to find a BMW second-hand engine for sale. Maybe you have dealt with a major accident, the motor might have seized, a cylinder top gasket blown, or even more causes. A lot of our daily lives highly depend upon our vehicles allowing us to effortlessly get to work and return home once again, which is why it’s essential to get an engine very quickly. There are several scrap yards in South Africa which strip BMW’s for their parts therefore we can help you without difficulty contact them! No matter the make or model, we are able to enable you to contact with scrap yards and engine parts companies through South Africa to discover whatever you require. We will hook you up to our own huge circle salvage yard firms. Along with tremendous diligence, our company has scoured the net to find all junk yards that strip BMWs and then sell their engines. It really means a single request sent to our company will go out to them all. This will save you the period of time attempting to make contact with many different distributors individually all on your own. This too suggests that you should have far better results discovering the engine you need. Whenever on the search for you own motor it’s important to sometimes perform a little research or sift through Gumtree advertisements and call each and every seller on your own. As soon as you make an enquiry with our company, its likely that you might find an BMW engine from up country. Under no circumstances are the prices pumped since you’re trading direct with the scrap yards. The business sells you the engine, so this means charges are not hiked up in anyway. The scrap yard will choose to contact you or email you immediately. You shouldn’t bothered as your telephone all of the sudden begins ringing non-stop, considering all distributors receive your enquiry all at once! In some circumstances chances are you’ll observe huge pricing among numerous quotes you obtain. Sometimes the least expensive choice is not necessarily the best! The usage of our services are a obvious when you essentially fully understand just how affiliated we are with the engine firms throughout South Africa. Either you ring us or make a web based enquiry. Prior to phoning be sure to have your engine number at hand (located on your car registration documents). Based upon supply availability you ought to be getting estimates from a variety of junk yards from within the region. Do keep in mind we will not only help you find BMW motors, we locate engines for sale from all car companies in South Africa. Save your time and cash by accessing our vast community of suppliers to find the engine that’s required without the need of running all over the city on your own. We are an online directory of businesses selling new, non-geniune and 2nd hand BMW parts. None of the scrap yards listed are authorised by BMW AG, BMW SA or its dealer network.